Storefront Art Studio is proud to present a fundraising exhibition of outsider art by and supporting NAEMI (National Arts Exhibitions of the Mentally III) artists. The exhibition runs from March 16 – April 20 with a public reception on March 16, from 6 to 9.30 pm. The artists in the exhibition are: internationally recognized Misleidys Castillo, who was born with brain, hearing and autistic impediments; Isaac Crespo, who creates situations where the absurd and irrational intertwines with characters drawn from real life; Sebastian Ferreira and Boris Lopez. A portion of the artwork sales will go to NAEMI to continue working and to achieve its objectives. The incredibly unique artwork is produced by untrained artists and is known as “Outsider” art. These artists haven’t been formally trained in art, work outside the artistic mainstream and have unconventional world views. Many suffer from mental illness. Social isolation and traumatic experiences inform the works of others. The roast has long existed as a performance event in which comrades & rivals, allies & antagonists, colleagues & competitors thrust winking slander upon each other. 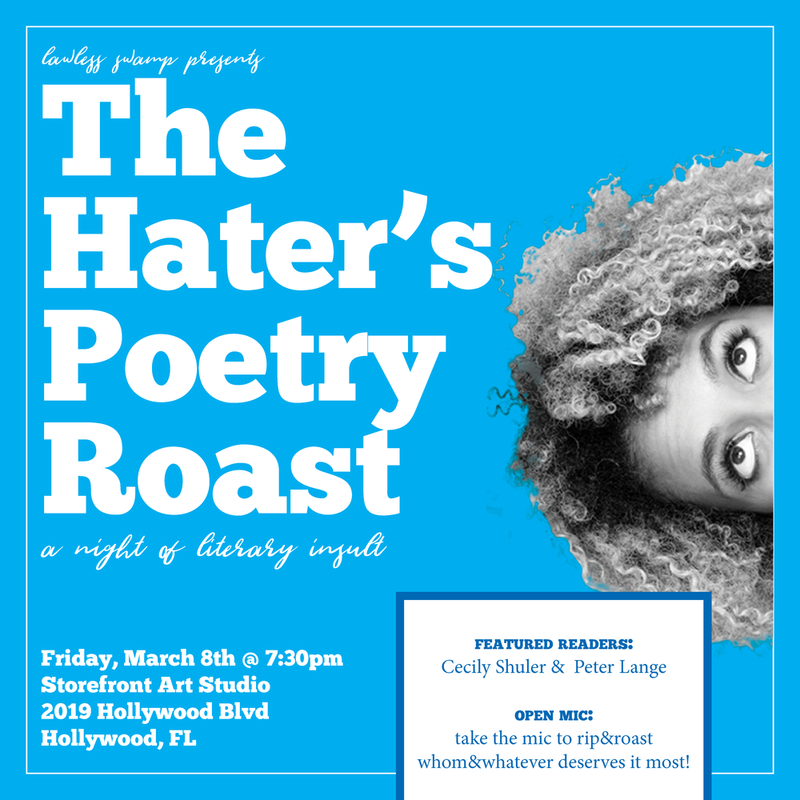 THE HATER'S POETRY ROAST is an open mic night in which all are invited to read poetry aimed at a particularly irksome target with humor, levity, and creative insult. Who deserves a dressing down--tinged, sometimes, with a lil bit of love? Poets are welcome to roast themselves, the CEO of Uber, that iguana that wouldn't leave them alone that one time, the latest collection from Comme des Garçons, incandescent light bulbs, Kanye's last album, Florida's never-calm mosquitos, the concept of "roasts," their MFA professors, their own mommas. We want performers who turn comebacks, burns, cheap shots, disses, insults, boasts, and toasts into poetry! With featured readers Cecily Shuler & Peter Lange. No poetry to read? Join in on one of our roast games sprinkled throughout the evening! Please note: bigoted language is highly unwelcome! THE HATER'S POETRY ROAST values the playful over the prejudiced, the creative over the cruel. Now get your reads ready, folks. Presented by Lawless Swamp and Hosted by Storefront Art Studio. 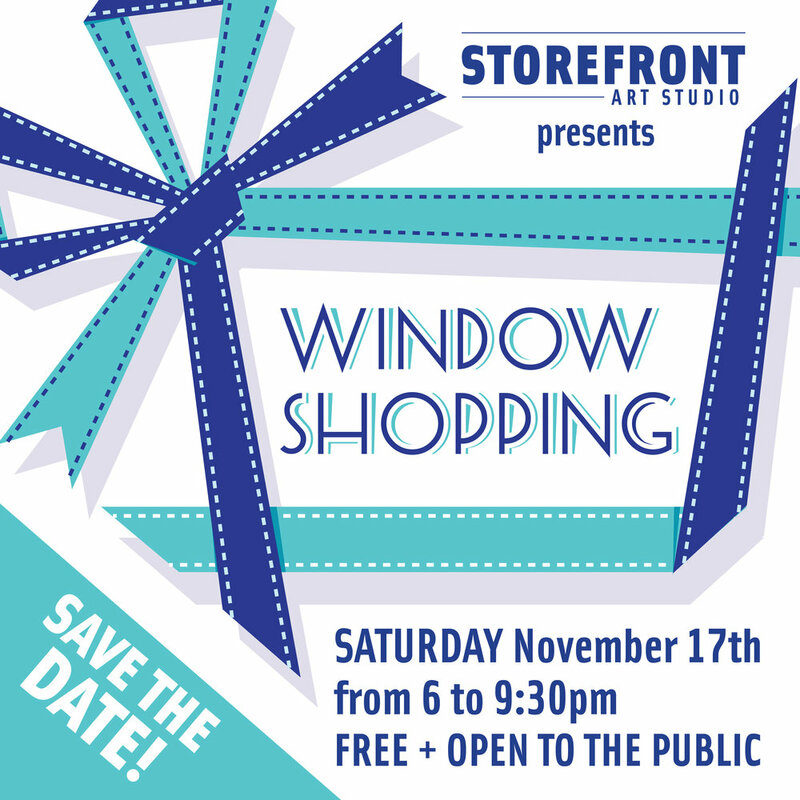 Storefront Art Studio is excited to present Window Shopping, an exhibition of paintings, sculptures and prints tailored for collectors and gift-givers. Window Shopping is curated by Brian Gefen and Jill C. Weisberg and will feature original artwork by local and national artists including Alissa Alfonso, Jen Clay, Virginia Fifield, Laura Marsh, Alice Mizrachi, Sri Prabha, REMOTE, Sarah Michelle Rupert, Matt Schumer, Carmen Smith, TRAP, Richard Vergez and Michelle Weinberg. Please join us for the opening on November 17th at 6:00 PM!